"A first chord, wide open, a brief moment of hesitation – and then the music begins. Quietly and composedly, truly simply yet touchingly it proceeds, at first letting on nothing about those last things it means to relate. 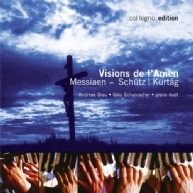 Heinrich Schütz (1585-1672) intended his choral work for small ensemble, 'The Seven Words of our dear Redeemer and Savior Jesus Christ,' to be a contemplation for the Holy Week; Hungarian composer György Kurtág (born 1926), rather than merely transcribing the work for two pianos has created a reduced and condensed version. Schubert and Ligeti? What appears at first sight to be a rather unusual constellation proves to be an essential combination on closer scrutiny. A few short waltzes: Andreas Grau and Götz Schumacher are waltzing their way through the centuries – from Schubert to Wolfgang Rihm.